This homemade costume for pets entered our 2017 Halloween Costume Contest. 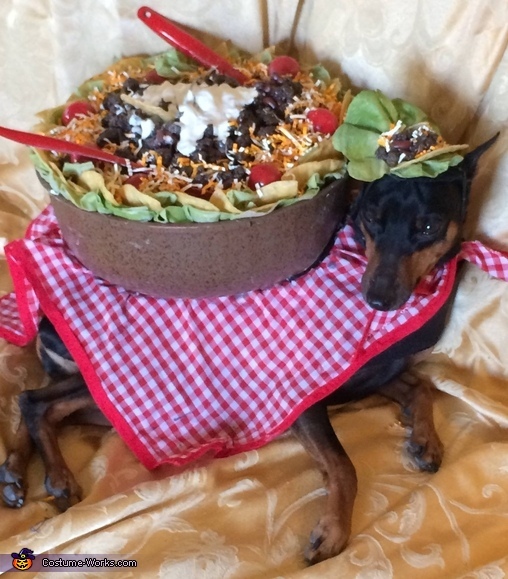 Jabez is wearing his taco salad costume that I created for him. I made a black fleece vest, using a pattern for a dog coat that I had. I made a tablecloth for the bowl to go on top of, using some fabric that I had on hand. I found the perfect size plastic bowl to use at my local dollar store. I cut a U shape out of the bottom so it would fit on top of the vest. Then I glued it down really well with hot glue. Next I filled it with broken styrofoam which I then covered with fabric. I put "lettuce" leaves all around the edge of the bowl. The lettuce leaves was made out of sheets of micro foam which I cut out, painted then curled with a heat gun. I took real tortilla chips, added extra color with spray paint then painted 3 coats of mod podge on them to make them sturdy (I used real chips since I hadn't figured out how to make a realistic tortilla chip yet). The hamburger meat was made of broken up styrofoam, acrylic paint and mod podge, which I put inside a large ziplock bag to mix it all up. I added a few dried kidney beans to the "meat" and placed the meat mixture into the bowl. Then I stuck a pair of salad serving pieces into the meat before it dried.The cherry tomatoes are wooded balls, painted red. I took shredded paper and spray painted half of it so I would get a colby/jack cheese to sprinkle over the meat. The sour cream on top is a fake icing made by mod podge. I was able to spread it on top of the meat after it had dried. I didn't weigh this costume, but it did not weigh much since most of the salad was made of some type of foam. I made a cute taco hat for Jabez to wear with it. Jabez won first place in a pet parade and costume contest in the small dog category.